Named by The Chattanooga Times as “the sheriff who always gets his man,” Charlie Taylor established a reputation as a “crime-buster” during his two terms as Hamilton County Sheriff. Taylor was elected in 1928 and won re-election in 1930. While serving as sheriff, he solved four bank robberies, all of which occurred before his administration. He tracked the suspects from the East to the West Coast and brought them back to Chattanooga to stand trial. Sometimes, while working on a case, Taylor would disappear. No one seemed to worry for they knew he would be back within a few days with his suspect in handcuffs. Ironically, of all of Taylor’s dealing with criminals, he never shot a man nor did he ever receive a scratch from them. Also, he never had a prisoner escape while in office. Although Taylor had his patrol officers ride motorcycles instead of drive cars, it did not seem to affect their crime-busting record. 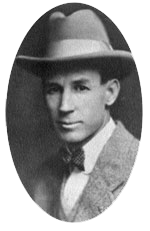 As the youngest sheriff to be elected, Taylor brought his unique style to the department. He was noted for his creased suit coats, shoes shined to a gloss, starched bow tie, and of course, a hat that looked like it was just purchased. During his term as sheriff, and later as a county detective, bachelor Taylor made his home in an apartment on the second floor of the jail. Continuing his career in law enforcement, Taylor served five terms as constable of the East Chattanooga district and nine years as a county detective. Taylor was also very popular in the community. While sheriff, he and his deputies gave ten percent of their salaries for a fund used to benefit the unemployed and needy in isolated rural areas. Charlie Taylor was a legendary Chattanooga law enforcement figure. He died on June 15, 190 at 77.